Genesis Alien Soldier (JPN) in 18:32.27 by Dammit & Truncated. 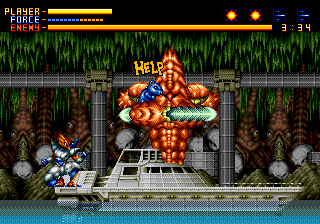 Alien Soldier, released in 1995, is a spiritual successor to Gunstar Heroes (you can tell by the cameo appearances of certain bosses), and a real treat in terms of production values as described in the tagline quoted above. The game's rather nonsensical plot boils down to the protagonist, Epsilon-Eagle, having to fight his former terrorist comrades (as well as everything on his path). Thankfully, speedrunners don't care about plots either way. What is more important is that Alien Soldier epitomizes Treasure's concept of an action game: a fast-paced, flashy, relentless boss rush. As such, it has 33 grotesque bosses, each of them promising a guaranteed game over for inexperienced players. However, using Epsilon-Eagle's vast arsenal of weapons and dodging abilities, the authors plow through the game's "SUPERHARD" difficulty without any regard to its name in this long-awaited movie, achieving a total in-game time of 8 minutes 13 seconds.